The United States Trade Dollar coin is a silver (fineness of .900 or 90%) dollar coin that was issued by the United States Mint and minted in Philadelphia, Pennsylvania, Carson City, and San Francisco from 1873 to 1885. 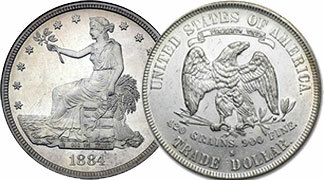 Trade dollar coins intended for circulation were last produced in 1878 and proof coin production continued until 1885. The coin weighs 420 grains (27.2 g), about 8 grains (0.52 g) more than the domestic silver dollar (Seated Liberty Dollar Coin and Morgan Dollar Coin of the time. It is 4 grains heavier than the Mexican peso coin; however, the peso is .903 silver.